C&B Equipment, INC.BLOGCompressorsWhat Causes Oil Carry-over in Compressed Air Systems? Many things can cause oil carry-over in compressed air systems. In a rotary screw compressor there are about four or five things you can first look at that don’t really cost you a lot of money. One item that could cause oil carry-over is that someone could be filling the oil reservoir too high. If there is too much oil in the reservoir,it has no-where else to go but downstream until it gets back to the normal oil level. The second thing that could be checked if you see oil carry-over in your compressed air system is the temperature. You need to make sure that it is not running too cold. If a rotary screw compressor runs, for example, below 160 all the time, it is running too cold. 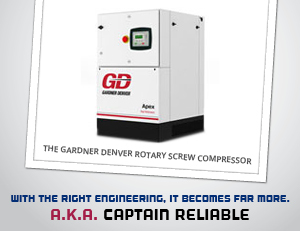 Rotary screw compressors like to run at about 185 to 190 degrees. If it is too cold it doesn’t allow the system to warm-up enough to let the system itself pull the oil out. The third thing to consider would be whether there is a separator filter on all of these units. Again, whether it is a rotary vein or rotary screw, the separator basically is set-up to where the air comes into it, the air hits the back side of the separator, drops the oil out in the air, and keeps moving. In the bottom of that separator housing there is a line, called a scavenge line. It goes from the bottom of the separator housing back into the air. This is where all of the oil that is pulled out of the air is dropped, and then re-circulated. Sometimes the scavenge line will get plugged-up, giving the oil no place to go, and it fills the separator up and gets shoved downstream. Degradation of oil can also be an issue. If the sytems goes for 3 years without anyone servicing the oil, that oil could degrade to a point where it could also cause carry-over. It is not lubricating like it supposed to, and It does not have the viscosity that it needs. In conclusion, there are certain things that you need to pay attention to. Most of the time it is very simple to see what causes the oil carry over. Please contact us if you have further questions.